One of the things about gardening is removal of the weeds or unwanted plants, and replacing it with plants that you want. 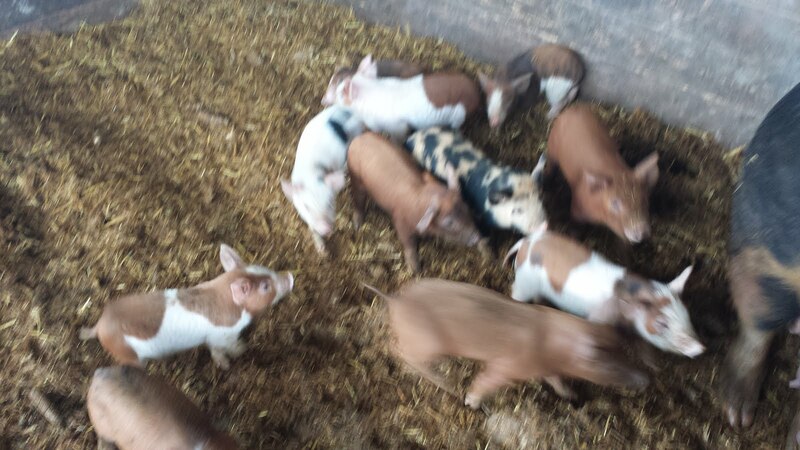 Lots of people do that with tractors, or by hand tools, or by hand, but I do it with piglets. In this case I made a small pen out of hog panels - They're 34" tall and 16' long. I string them together using bits of high-tensile fence wire bent into spirals. If you look on the left side of the picture above, you'll see one of the coils there. This is actually one of the best ideas for this sort of thing that I've run across. High tensile fence is about 3 cents a foot, and so this closure costs me between 30 and 50 cents, and is re-usable. To attach two panels together you start at the top and "screw" it into the panel. The wire is plenty tough enough to hold the panels together, and the joint can be used for a corner or a sharp bend, so you don't have to bend up or damage your hog panels in any way. Pretty slick! So I make a pen with these panels, drop in a calf dome for a shelter, and add some piglets. 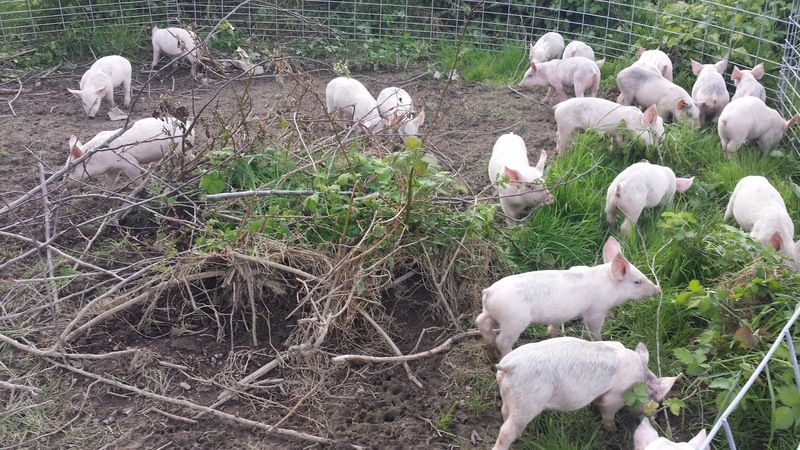 The top picture in this post shows the difference that one day of grazing by the piglets makes. Most of the vegetation is gone, and all of the above-ground weeds are removed. 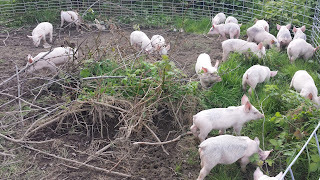 Sticks, brush and trees do slow the weeding process down, but the pigs will remove everything - and then I'll creep the pen in the direction I want to clear. This works very well between trees in an orchard, between rows of grape vines, or in garden areas being prepared for planting. If I'm going to plant something in this soil I can either lightly till the soil to remove the roots, or sow directly into the soil. 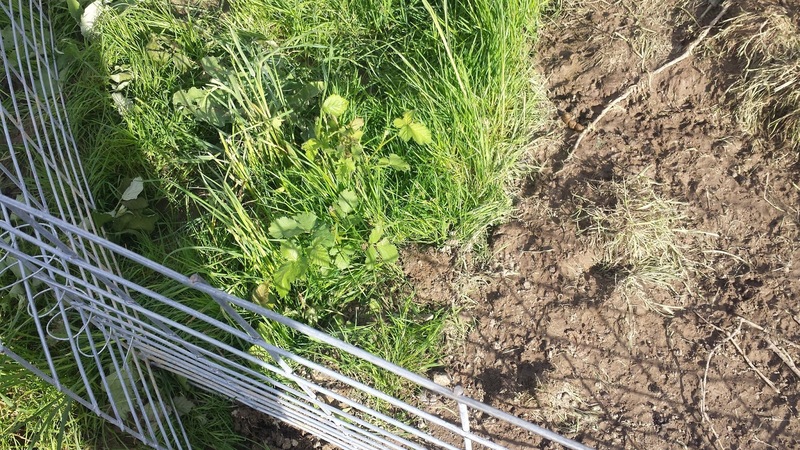 The pigs have added urine and manure to the mix, and have trampled and chewed on everything they didn't want to eat, and even if the weeds have roots remaining it's not every hard to keep them in check. In this case I'm having the pigs clear out blackberries and volunteer grass from between the rows in my vinyard . 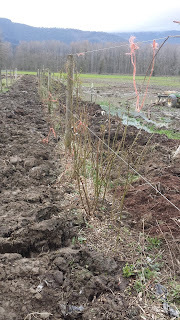 I planted the vinyard in 10' wide rows to allow me to do this sort of activity; I just bend the hog panels so that the pigs can't get at the young grape vines and move it 5 to 10' a day. It moves pretty easily; I use pull the panels by hand, and the pigs walk inside their pen, and enjoy the new salad bar. Note: While pigs do enjoy rooting and will supplement their diet with whatever they find in their pen, I'm still offering them a complete ration free-choice. They don't have to be hungry to do this sort of work, and little guys like this need proper nutrition to keep themselves in good shape and to grow as they should. If you run across someone who claims that pigs can be raised on forage alone take those claims with a grain of salt. 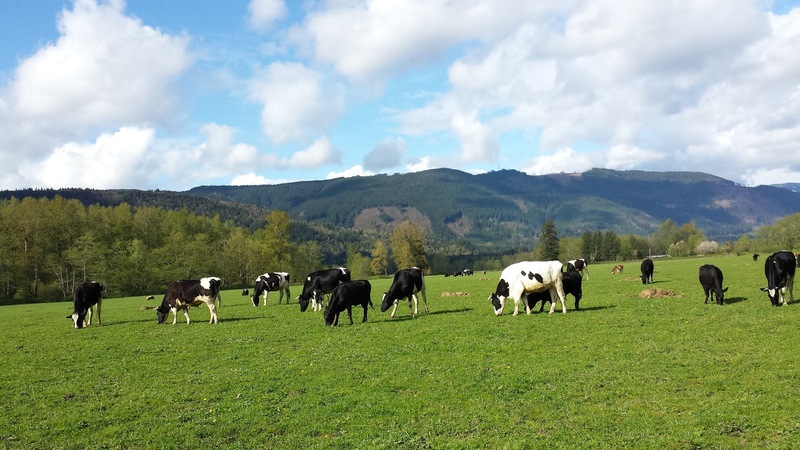 I have an old railroad grade that runs along the south edge of my property - the county purchased it a decade ago for use as a trail, and I really hadn't thought much about it until they came and mowed it, and suddenly I've got a cow highway! They are! The cows are acting nonchalant, but they'll drift over and eventually they'll form a semi-circle around me to solemnly scrutinize whatever fascinating thing I'm doing. It's a bit of a chore to put the fence up, but I do like working with my hands and doing a neat job of it. 3 days of work and I've got the first 2,000 feet fenced; I'll finish the other 2,000 feet Monday or Tuesday of next week. Because this is a permanent fence, I'll take the time to run my track hoe down the fence line to smooth the ground underneath the lowest wire - I want a consistent 12" clearance, and I'd like to be able to be reasonably sure that the fence is able to contain all of the livestock, pigs and cows alike, so a little extra work now means that I should have years of trouble free fencing. This year I'll be doing cross fencing to make the pasture into paddocks that I can use for different purposes; some for hay, some for corn, that sort of thing. More on that later. There is nothing that a cow finds more delicious than young fruit trees, and they'll destroy them if they get the chance. So I'm putting a good fence around my new orchard to protect it. I've been using high-tensile fences as my go-to fence for the last 5 years. When I first started I made 8 or 10 wire fences; right now my current standard is 4 wire fences, and I find that works well to keep the pigs and cows where they should be, and also works with dogs, which was a bonus for my airedale pack. When I started using high tensile fences I used 4x4 posts for the braces. Even pressure treated they don't hold up very well to cattle and pigs; a cow won't break your high tensile fence running into it, but may very well snap the post and lay the fence down in that area enough so that they can get out. So I switched for a while to 6x6 posts for the braces, and then downgraded to 4x6 braces for cost reasons. 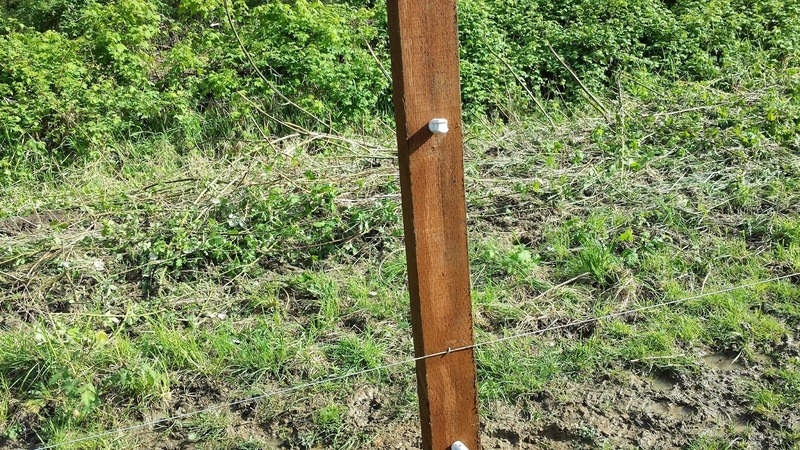 My current braces are constructed of 4x6 posts, and the field posts are also 4x6 to make them more resistant to snapping if they get heavy contact from livestock or a careless tractor operator. High tensile is not meant for short distances - it's great for long runs, but at the end of every run there needs to be a brace, and most of the time it's a double H brace. 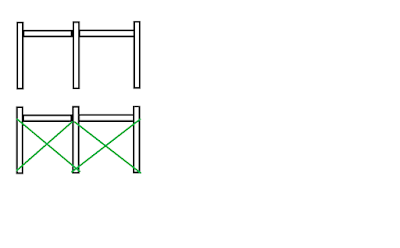 The picture above shows a double-h brace (top) and a wire-reinforced double H brace, bottom. The wire helps support the H brace against pulls to the left and right, and if you're going to have a good tight fence you need this sort of really sturdy H brace to make it go. In my area 4x6 timbers are $18 each, so the brace itself costs $90 for the wood. I use (3) 80lb sacks of concrete at the base of each post at $4 each, adding another $36. Each individual line will need a spring and a tensioner, that run about $8 each, so for my four wire setup you're going to add another $32. the ceramic insulators that I use are a couple of bucks (more on these later). I mention that because its' basically $126 in material costs for each end of your run, plus $32 for the hardware between it. The wire itself is about 3 cents a foot. For long runs I put a double H brace every 500 feet, or on either side of a gate opening wherever they are. The longer the run the better the economics are. I'm describing a really hefty brace for a reason; I've pulled braces out that were set on driven-posts, were constructed of too light a timber, or just weren't beefy enough and I squished them as I tensioned the fence. If you want a good fence you make a good brace. 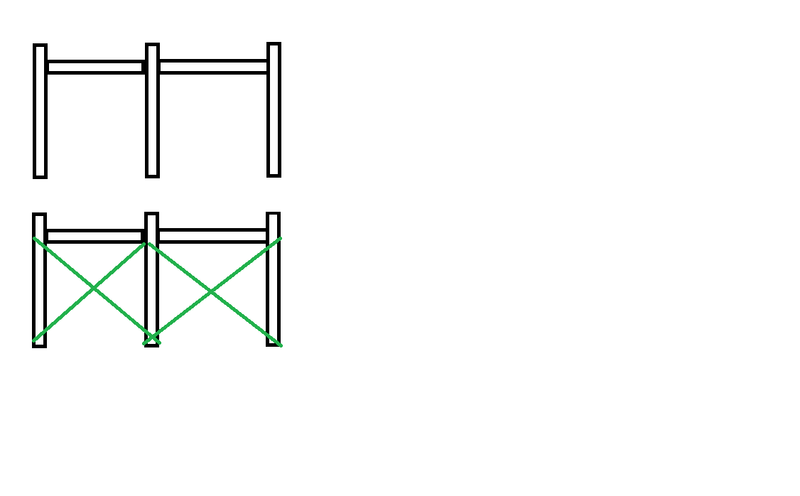 The picture above shows an end-of-run fence brace. I electrify the top and bottom wire of the brace. The wires are spaced 1' apart, starting 1' off the ground. 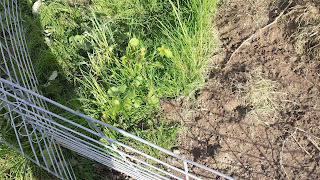 I have tried wires lower than 1' and it's just too much of a nuisance with weeds and other stuff contacting the lower wire. 12" seems to be low enough to deter pigs, but high enough to reduce fence shorts. 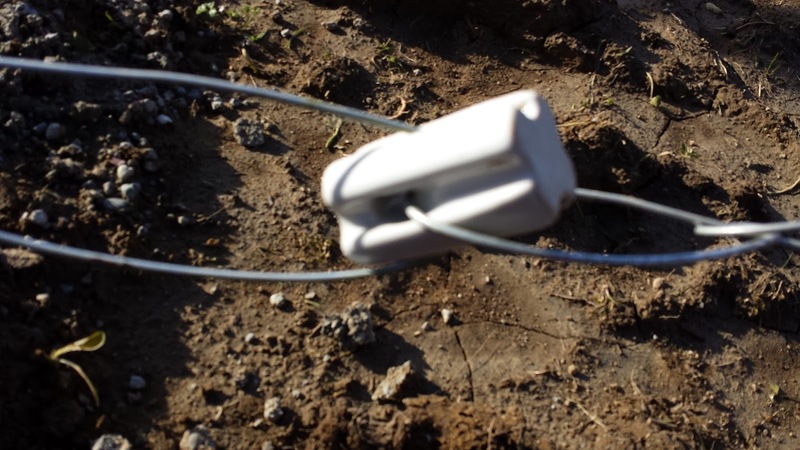 The top wire is 48" above the ground level, and is the primary wire that keeps the cows in. 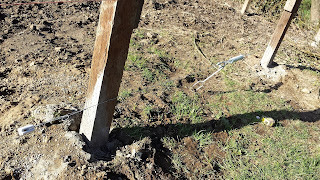 The two wires in the middle are just there to prevent animals from ducking under the top wire, or jumping over the bottom wire. 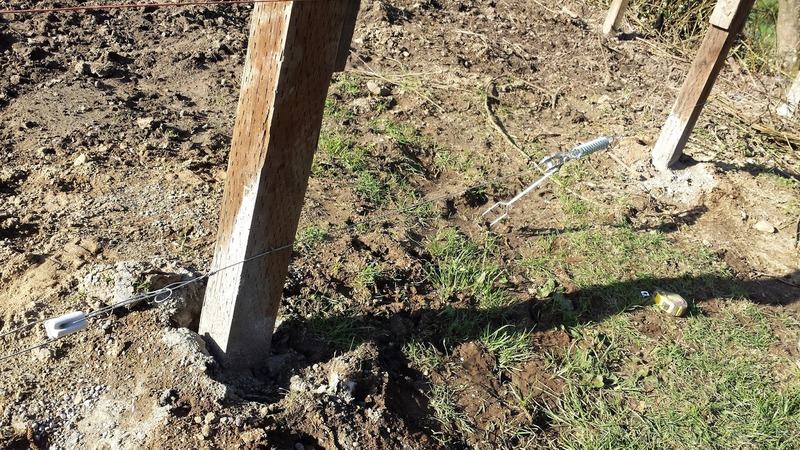 I will place field posts so that I can direct the wire up or down to follow the ground contour, and I'll smooth the ground so that there's no depressions under the fence. 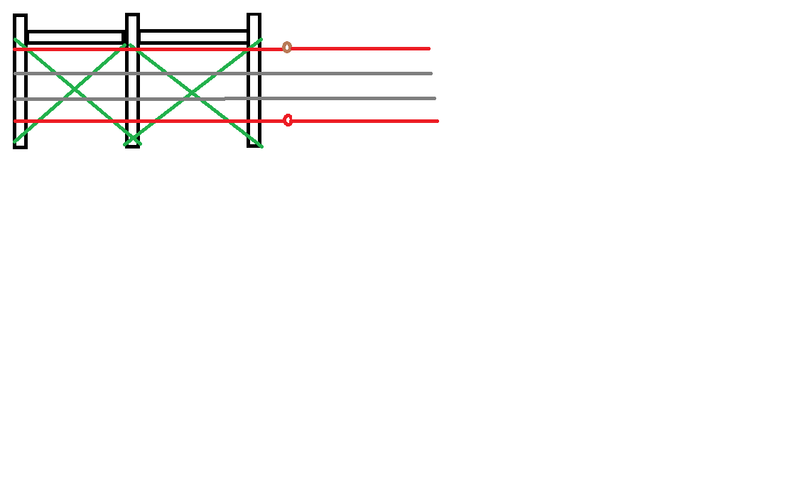 I used to run my hot wires across the H brace but I had problems both insulating the hot wires from contact with the brace reinforcing wires (green in the pictures above) and with the posts. there are various plastic tubes you can use, but I've never been happy with any of them. I've switched to ceramic insulators and they do the job nicely. 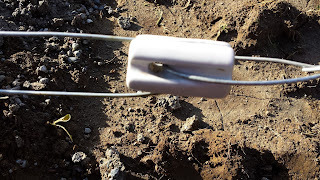 Note position of ceramic insulator outside of brace area. I put my tensioners in the brace area. With the ceramic insulators placed, I can then tighten the fence without having to turn the fence off, and I have a cleaner electric fence line - so I can go longer distances and deliver a better shock. The less contact the live wires have the more range you get out of your fence charger. 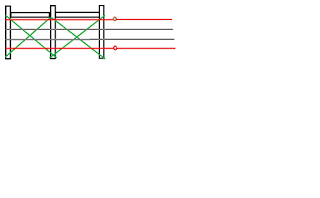 So I'll make a brace at one end, and t hen the other, and then I'll run a neutral (non-electric wire) between the two. 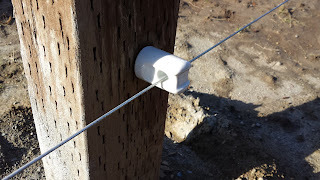 I'll tension that wire, and that gives me a line to place my field posts. I've settled on 30 to 40 feet between fence posts, and found that for a pretty fence an even spacing is all that you need. Note: if you are in the pacific northwest, and want to keep bees, THIS IS THE TIME TO DO IT. You have the month of april to get your hive started, and there's plenty of places selling packages that are local. Check the farm and garden section of craislist in your area or your local bee store. Beez Kneez in Snohomish is a good one. This is where a straight row really pays off. The rototiller fits exactly between the rows, so tilling up the area between the plants is pretty easy. I put down a bunch of compost prior to the tilling, so it's mixed in between the rows. 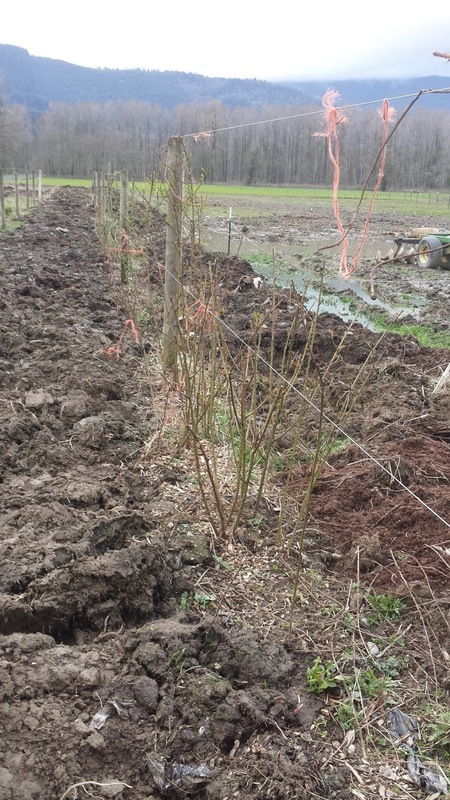 This row is the berry row; marion berries and raspberries. Several varieties; this year I'll take a look at how they are doing and cull the non-performing plants in favor of the cultivars that do well. With marion berries and raspberries that's pretty easy - take parts of the plants that work and just move them down the row. Marion berries will grow roots if you bury the tip of the vine in the soil. Raspberries can be propogated by digging up a bit of the growing plant. The packages of bees arrived today, so I went and picked them up. I set up a new package in a deep super, which is the bottom box in a bee hive. The new bees will chew their queen out of her cage (she's held in by a marshmellow) and spend the next day or to scrubbing their hive and making it their own - they will patch any holes in the hive, start producing wax to build out comb and generally get the hive ready for business. After they concentrate on that box for a couple of days I'll add a second box to give them more space. The metal circle in the top picture of a package of bees is a can with sweet food for the bees. Sometimes it's sugar, sometimes corn syrup, they feed off that while they're being shipped. The queen is kept in a very small cage that is attached to the package next to the feed can. 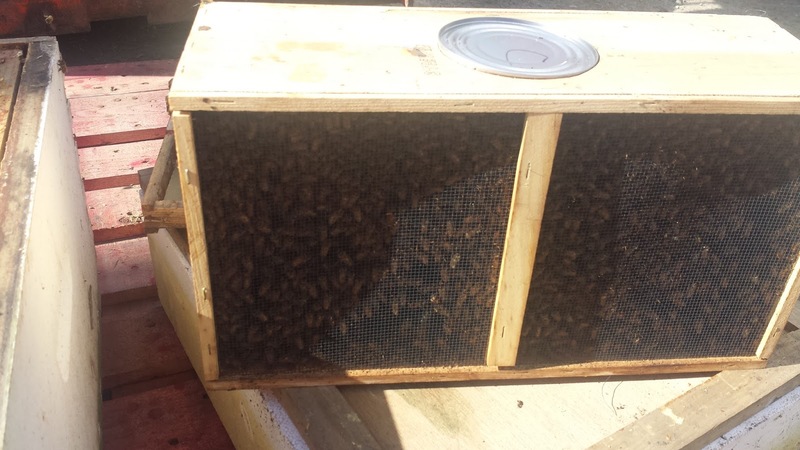 So the process of "hiving" a package is to set the hive up with its frames, then take the center 3 frames out. 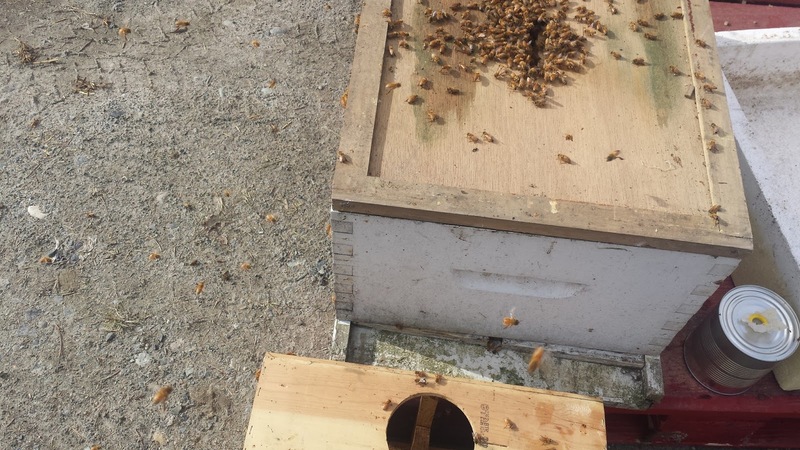 You rap the package on a hard surface to knock all of the bees to the bottom, and then carefully pull out the feed can. That allows you to access the queen cage, and you pull that out and then replace the can to keep the rest of the bees in the container. The queen cage is capped with a small cork. Making sure not to let the queen out you replace the cork with a marshmellow, and then place the queen at the bottom of the hive. Then back to the pack, another sharp rap, and then you pull the feed can and dump the 10-15,000 bees into the space left by the three frames. You'll have to shake it a bunch of times to get most of the bees out, and then you carefully, and gently, replace the frames. I use a hive inner lid, which is shown, and it has an oval hole it in. I'll gently place that on top of the hive and then let the straggler bees find the hive and enter it via the hole. Around sunset they are all in there, and I slip the lid on and that's it. I don't wear protective gear doing this; the bees are usually pretty mellow, but I do use a little smoke. No gloves, no veil. just calm, purposeful movement. I think I'm getting less sensitive to stings; i did get stung once - i accidentally smashed a bee while lifting the hive, but that happens sometimes. I like to listen after dark to the new hive. What I like to hear is the chewing sound of the bees doing their housekeeping. it's pretty subtle, but it shows that they are customizing their new home. I restrict the entrance to the hive to a single 1/2" notch. This allows the bees to keep raiding bees from other colonies out; a couple of guard bees can easily block the entrance, and this helps the hive concentrate on making their new home.